MoJo Promotions supply a splendid catalogue of personalised betting products, all designed to be custom printed with your message. Betting Products provide a fantastic way to advertise your logo. The fun and practical features held by personalised betting products is ensured to ensure your advertising needs are met. 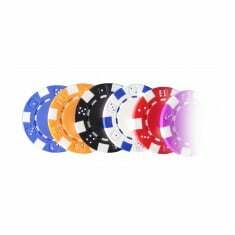 Our selection includes - Bespoke Poker Chips. All of our items can be branded to suit your objectives, please contact us for more information. Made from ABS plastic. Bespoke made. Trim pantone matched. Printed to centre.